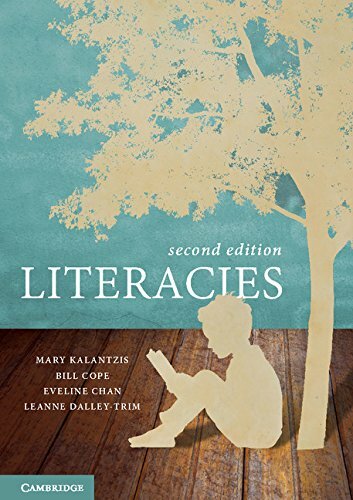 Welcome to the Literacies website, which presents supporting material for the book by Mary Kalantzis and Bill Cope, published in its second edition by Cambridge University Press with two additional authors, Eveline Chan and Leanne Dalley-Trim. Literacies presents a contemporary approach to literacy learning and teaching, developing and extending ‘Multiliteracies’ theory and practice. This book supplements traditional ideas of literacy in the singular—learning to read and write—by expanding the area of focus to cover literacies in the plural. Today’s communications environments, particularly since the rise of digital media, are increasingly multimodal. Written meanings are closely connected with visual, spatial, tactile, gestural, audio and oral modes of meaning. It is hard—in fact, it is a mistake—to try to separate reading and writing from these other modes for the practical reason that they are so closely related to today’s media. Navigating contemporary social spaces requires the application of not just one set of rules for meaning-making (literacy in the singular), but the negotiation of different literacies depending on the people and contexts you encounter. There are, in other words, many literacies and these vary according to cultural context, social purpose, life experience, personal interest, knowledge base, and so on. The key is not learning how to communicate in the one, right way, but how to negotiate these differences in meaning. As a practice deeply embedded in the modern history of education, there is not one educational practice of literacy, but several. For the sake of clarity of analysis, we identify four main approaches to literacy teaching and learning: didactic, authentic, functional and critical literacies. As we move forward, we need to build upon and extend these by deploying literacies pedagogies in the plural—which we rename as experiential, conceptual, analytical and applied approaches. We are not just interested to focus on literacies as communication (meaning for others, as supports for social interaction). We are also interested in literacies as a form of representation (or meanings for ourselves, as supports for thinking). In this sense, literacy is not just a subject ("English" or "Language Arts"). Literacies in the plural are central to all subject areas and all learning. CGScholar is a multimodal writing and assessment environment. Created by Bill Cope and Mary Kalantzis with a team of software developers and pedagogical designers, CGScholar is an attempt to put into practice the ideas about contemporary literacies and learning explored in this book. The book and the website can stand alone, or they can be used in and with CGScholar. More information about CGScholar, including user tutorials, can be found in our Getting Started in CGScholar series. For course coordinators and learners intending to use CGScholar, we offer two Literacies Learning Modules. The first, Literacy Teaching and Learning: Aims, Approaches and Pedagogies, covers chapters 1-7 of the book. The second, Multimodal Literacies: Communication and Learning in the Era of Digital Media, covers chapters 8-16 of the book. These includes multimedia content that can be posted for class discussion in CGScholar’s Community app, short answer surveys, and writing projects for students to undertake in CGScholar’s multimodal and collaborative writing space, "Creator." The CGScholar bookstore also contains rich collection of learning modules illustrating the Learning by Design or Multiliteracies pedagogy outlined in this book. These align with the Australian Curriculum and the US Common Core Standards. Literacy Teaching and Learning: Aims, Approaches and Pedagogies (chapters 1-7 of the book). Multimodal Literacies: Communication and Learning in the Era of Digital Media (chapters 8-16 of the book). We also offer a course as part of our online offerings through the University of Illinois, EPS532: Knowledge, Learning and Pedagogy, and EPS 554: New Media and Literacies. You can enrol in this course as a non-degree student, or take it as part of our fully online certificate, masters and doctoral programs in Learning Design and Leadership. The ‘Literacies’ book and this companion website cover an enormously wide territory. For practical reasons, we provide several kinds of navigational aid to help readers through the text. Each chapter begins with an overview, which introduces the main points that it will address. The main narrative is then divided into parts with a structure of subheadings so you can locate particular ideas easily. Each chapter ends with a summary table that captures the argument analytically and synoptically. This book addresses many big ideas, with only a small space for each idea. A Further References list for each chapter is to be found in this website. This book introduces a holistic orientation to instructional design based on an epistemological theory of learning, categorising learning activity types into the four ways of knowing described in Chapter 3: experiencing, conceptualising, analysing and applying. These are types of knowing-in-action through which teachers can enable learners to engage productively with literacies. We suggest you try them out as a learner and teacher yourself. Here, we suggest lines of inquiry and research you might pursue to build your own understanding of literacies and their pedagogies. In other words, this section is an invitation to be an educational researcher and thinker, to build your own pedagogical knowledge base as you engage with activities that exemplify the four epistemological frames. The end of each chapter has a glossary of key terms, arranged in the order in which they appear in the text. These are indexed alphabetically on this website. It is in the nature of academic work to create a technical language that is more precise in the meanings of words than in everyday language. This technical language may at first seem unclear, particularly when precise meanings are confused with commonsense meanings. We want to expose those coming newly to the study of literacies to different points of view representing a range of theoretical perspectives, from different eras and from different parts of the world. These are mentioned and cited at relevant points in the text and can be found in this website. Some of these texts address theoretical questions. They are at times difficult to read, particularly if you are unfamiliar with the disciplinary genre they represent—but being intellectually challenged, even to the point of having to move beyond your comfort zone, is a part of the learning process. Other texts are more practical and descriptive, and thus more accessible. Either way, these are original sources. We wanted you to hear people speaking in their own voices, rather than just tell you what we think they are saying. We hope you find this book and website an intellectually challenging, and most of all, enjoyable experience.